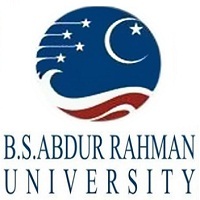 About: BS Abdur Rahman University Engineering Entrance Exam (BSAUEEE) is a University Level Entrance Examination conducted by BS Abdur Rahman University to provide admissions to the eligible students in various undergraduate engineering courses. Grandiosity: BS Abdur Rahman Crescent Institute of Science and Technology was founded in the year 1984 at Crescent Engineering College now the university has an immense growth with 48 programmes, grouped under 12 different Schools, 27 Undergraduate Programmes, 20 Postgraduate programmes, and Ph.D. Conducting Authority: BSAUEE is conducted by BS Abdur Rahman University. Courses: The BSAUEE 2019 exam is a gateway for admissions to undergraduate engineering programs offered by B. S. Abdur Rahman University including B.Arch/ B.Tech/ B.Tech (Lateral Entry) in Civil/ CSE/ ECE/ EEE/ E&I/ IT/ Mechanical/ Automobile/ Aeronautical/ Polymer and Biotechnology. 30 Centres in India Approx. Admit Card: The Admit Card will be available online for candidates from 16th April 2019. Examination: BSAUEEE 2019 will be conducted Offline i.e. Pen & Paper-based Test (PBT) on 21st April 2019. Results: Result will be declared on the official website for all the candidates on 2nd May 2019. Counselling: Candidates who have cleared the BSAUEEE 2019 will be called for the counselling process which will be held on 2nd June 2019. The candidates must have passed 10+2 examination with Physics, Chemistry, and Mathematics/ Biology as a mandatory subject with minimum 60% marks conducted by State Board / CBSE / ICSE or equivalent examination. The candidates must have passed Diploma (3 years) in Engineering/ Technology awarded by state Board of Technical Education or Equivalent with a minimum of 60% marks. The candidates must have passed B.Sc Degree from a recognized university with Mathematics as a mandatory subject with a minimum of 60% of marks. Age Limit: Candidates applying for BSAUEEE should be born on or after 1st July 1996. Syllabus: The BSAUEEE Syllabus will be majorly focused on the subject from the qualifying examination i.e. 10+2 subjects. Topics: The syllabus comprises of topics from Physics, Chemistry, and Mathematics/ Biology. Books: Candidates are advised to refer the books which are related to the syllabus topics. Mode: BSAUEEE 2019 will be conducted Offline i.e. Pen & Paper-based Test (PBT). Question Type: The question paper will be of Objective Type Multiple Choice Question's (MCQ's). Sections: The question paper consists of 3 sections which include physics, Chemistry, and Mathematics/ Biology. Duration: The time given to complete the examination will be 2 hours i.e. 120 minutes. No. of Questions: Physics - 25, Chemistry - 25, and Mathematics/ Biology - 50. Marking Scheme: +1 marks will be given for the correct answers and -1 mark will be reduced for incorrect answers. Medium: The question paper will be in English and Hindi. Note: Candidates are advised to keep a copy of successfully filled Application Form with them for future reference. Centres: BSAUEEE will be conducted in 22 centres across India. Preference: A candidate appearing for BSAUEEE shall give his/ her preference for the centre at the time of filling the Application Form. Note: No request for change of centre/ venue/ date/ session for Examination shall be entertained. Get more information about BSAUEEE 2019 Exam Center. Admit Card Date: The Admit Card will be available online for candidates from 16th April 2019. Details on Admit Card: Admit Card will contain the personal details of a candidate, registration details, date, time and centre of examination for BSAUEEE 2019. Cross Check: In order to avoid any sort of discrepancies thoroughly check all the details mentioned in the Admit Card. Results Date: Result will be declared on the official website for all the candidates on 2nd May 2019. Merit List: Once the results have been published the merit list will be prepared on the basis of the higher mark secured in BSAUEEE. Post Results: After the results, the candidates should be prepared for the counselling rounds if he/ she has cleared the BSAUEEE. Admission: Admissions in B.Tech are also provided on basis of JEE Main score. There will be separate rounds of counselling will be held on the basis of both the tests. The Hall Ticket is issued to the Student satisfying the attendance and other requirements as per rules, regulations and instructions issued by the University from time to time. Students shall take their allotted seats in the respective Examination hall at least fifteen minutes before the commencement of Examination. Students shall not be allowed to leave the Examination Hall before the expiry of 45 minutes from the commencement of Examination. Strict silence should be maintained in the Examination Hall. Students who are not properly attired will not be admitted to the Examination hall. Please ensure that you comply with the dress code of the University. Students are required to bring their own pens, pencils, calculator and eraser. Students should use only blue or black ink while answering their papers. After receiving the answer book the Student shall write his/her Register number, Semester number, Course code, Course name, Session and Date of examination at the appropriate space provided in the first page of the answer book and nowhere else in the answer book. Writing of wrong register number in the answer book will entail rejection of the answer book. Students are not allowed to exceed the prescribed time assigned to each question paper. Students shall not talk/ask questions of any kind during the Examination. Students shall not carry any written/printed matter, any paper material, watch, cell phone, pen drive, I-pad, programmable calculator, any unauthorized data sheet/ table into the Examination hall and if anything is found in their possession they shall be liable for disciplinary action. No Student shall pass any part or whole of answer papers or question papers to any other Student. No Student shall allow another Student to copy from his/her answer paper or copy from the answer paper of another Student. If found committing such malpractice, the involved Students shall be liable for disciplinary action. Students found guilty of using unfair means of any nature shall be liable for disciplinary action. Students will have to hand over the answer books to the Invigilator/Hall Superintendent before leaving the Examination hall. Hall Ticket is an important document. If the hall ticket is lost/ or not brought a fine of Rs. 200 will be levied. Application availability: The candidates can avail the application form for the BSAUEEE 2019 from 18th January 2019 to 15th April 2019 on the official website. Admit card availability: Once the candidates have all applied for the BSAUEEE 2019 exam the examination authority uploads the admit card on the Official website. The candidates can avail the admit card from 16th April 2019. Exam date for Online: The BSAUEEE 2019 Online and Offline exam will be held from 21st April 2019 and 21st April 2019 respectively. Declaration of results: After the exam has been conducted the results will be announced on the official website on 2nd May 2019. Counselling Date: Once the results of the BSAUEEE 2019 exam are announced the counselling session begins at 2nd June 2019. Candidates should have passed the 12th standard examination conducted by State Board / CBSE / ICSE or equivalent examination with a minimum aggregate of 70% marks in Mathematics, Physics, and Chemistry. Biotechnology: For Biotechnology a Minimum 70% aggregate in Mathematics (or) Biology, Physics, and Chemistry. Engineering: Candidates should have appeared for the Engineering Entrance Examination (BSAUEEE 2019) conducted by the University or should have a valid score in JEE (Main). Step 1: The candidate has to get the BSAUEEE 2019 application form from one of the centres or get a print out from the official website. Registration Process: The registration for this examination can be done online and offline. Online mode: Candidates can apply through the official website of BSAUEEE 2019. Offline mode: Candidates have to get a form from the designated centre or print from the official website and fill with valid information and paste passport photograph. Registration for the BSAUEEE 2019 can be done through the online application form or offline application form. The candidate has to fill the BSAUEEE 2019 form from the official website or collect the form from the designated centre or take a print out from the official website. The BSAUEEE 2019 application form will be available on the official website or from any designated centre 18th January 2019. The last date to submit the BSAUEEE 2019 application form is 15th April 2019. Exam fee for BSAUEEE 2019 will be INR 750 for all the candidates. Official website: Availability of BSAUEEE 2019 admit card will be online and through the official website. Date: The admit card for BSAUEEE will be available from 16th April 2019. Enter necessary details: Candidates who want to access the BSAUEEE 2019 admit, candidates have to enter the application number and the password in order to access the admit card on the official website. Print & preserve: The candidates can then download and print the BSAUEEE 2019 Admit card. They have to retain the admit card until the seats are allotted. Mode and subjects: The Candidates must attend the examination offline i.e. pencil and paper-based. Physics: Number of questions will be 25. Chemistry: Number of questions will be 25. Mathematics: Number of questions will be 50. Biology: Number of questions will be 50. Marks and Time: Total marks will be 100 for BSAUEEE 2019 of 2 hours. Marking: There will be 1 mark given for each correct answers. Medium: The examination can be taken in English. The syllabus of BSAUEEE 2019 comprised of three subjects – Mathematics/Biology, Physics, and Chemistry. The BSAUEEE 2019 results will be declared on 2nd May 2019, on the official website. In order to access the results, the candidates will have to log in to the BSAUEEE 2019 website. The candidates then have to visit the results link on the official website. Download the counselling letter which is the most important letter to carry at the time of counselling. Where can I get BSAUEEE online application form? Hi I am Chachu, May I know when is the online Application form for BSAUEEE available? U can follow the link given below to know more about the application form details. I got 237 rank in BSAUEEE? Hi I am Kriti, I got 237 rank in BSAUEEE, which branch can I get?